Every time the Curiosity Rover drills into Mars, it creates a beautiful dime-sized hole and a pile of powdered rock just waiting for analysis. Here’s why these drill holes are so important—and all the technology that makes them happen. The drill on the Mars Curiosity rover functions as a hammer and chisel. The hammer has six levels of intensity from gentle taps to vigorous bangs, all at 30 times per second. The drill produces holes that are slightly smaller than an American dime: 1.6 centimeters (0.63 inches) in diameter and 6.4 centimeters (2.5 inches) deep. The eight main holes drilled into Mars have certain similarities—almost all of them are preceded by a shallower test-hole, they share hole geometry of diameter and depth, and they’re all surrounded by a pile of rock dust. This dust—the hole tailings—isn’t waste. Instead, the powdered rock offers insight into the chemical composition of the subsurface by allowing Curiosity to scoop up a sample for direct testing. Flutes on the drillbit pull powdered rock out of the hole so it can be fed into the Sample Analysis at Mars (SAM) suite for chemical analysis. The instrument package includes a gas chromatograph, a mass spectrometer, and a laser spectrometer. They work in conjunction with the Chemistry and Camera (ChemCam) instrument and the Chemistry and Mineralogy instrument (CheMin) that can perform mineral analysis from a greater distance. But even without fancy analytical equipment, even just looking at the tailings is enough to get a sense of the variety of rocks present on Mars. Most times the tailings are shades of grey, sometimes tinging towards green or even a steel blue, while very rarely they share the same rusty red of surficial dust. The tailings can be fine grains of spilled powder, or sometimes forms almost clay-like clumps. On February 2, 2013, the Curiosity rover used only the percussive hammering action of the drill without rotary twisting on chunk of flat mudstone named John Klein. The drill on rock checkout test took place on Sol 176, the 176th Martian workday for the Curiosity rover. Its purpose was to test out how the drill functioned on just rock. The grey divot extends 1.7 centimeters (0.66 inches) wide: everything looked great. The rock was named in memory of a Mars Science Laboratory deputy project manager who died in 2011. After a bit of fussing, the drill functionality tests continued on Sol 180 (February 6, 2013. The mini drill test used both percussive and rotary action to create a very shallow hole is just 2 centimeters (0.8 inches) deep surrounded by a ring of rock powder This test allowed researchers to characterize the drill tailings—the rock powder generated as waste from the drilling process—and determine if the tailings were suitably dry powder appropriate to feed into the sampling suite. Again, everything looked fantastic. The very first time Curiosity used its drill for real, actual science was to drill a full sampling hole on Sol 182 (February 8, 2013) into a flat rock named John Klein. John Klein is part of the Sheepbed mudstone, an outcrop in the Yellowknife Bay area of Gale Crater. Researchers think Sheepbed is part of an ancient lake from the Noachian Era of Martian history. The rock theoretically formed in a wet environment characterized by neutral pH and low salinity. They think the environment would have variable oxidation and reduction of iron- and sulfur-containing minerals, occasionally rusty red (oxidized) or greenish-grey (reduced). The most immediately noticeable feature reflects that variability: the interior of the hole and the extracted rock powder are a greenish-grey in stark contrast to the rusty red surrounding surface. The rock tailings are processed and delivered to the analytical suite by the Collection and Handling for In-situ Martian Rock Analysis (CHIMRA) instrument, which sieves the sample to remove particles larger than 0.015 centimeters. The instruments require only a tiny total volume of rock for analysis: John Klein only delivered a volume equivalent to half of an aspirin tablet. The analysis confirmed the initial near-intuitive answer to this mini-mystery of different colours: the rock contains iron minerals which oxidize in the surface and are not yet oxidized underground. This is exciting in part because less oxidized samples are more likely to preserve any organic compounds if they were present in the first place. 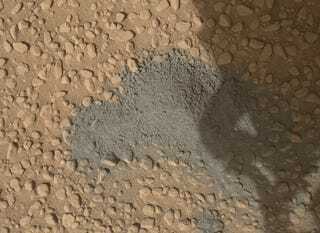 Now the rock powder is exposed to the thin Martian atmosphere, the iron will slowly rust to red over time. Peeking into the hole, the interior of the rock is made of very even, fine grains of mud in flat layers, all cut by an irregular network of sulfate-filled hairline fractures. The suspiciously-vertical pits are burn marks from the Chemistry and Camera (ChemCam) instrument firing lasers into the hole to determine chemical composition. The ChemCam also performed a series of sampling zaps into the drill tailings on Sol 183. These zaps provided spectra which researchers interpreted to determine composition of the rock powder extracted from the drillhole. To confirm results from John Klein, Curiosity drifted to the nearby Cumberland rock. Just 2.75 meters (9 feet) away from the first drill target, the two rocks have a similar appearance so researchers hoped would produce a similar analytical results. The Curiosity rover created a before and after photo-pair for its drilling adventure at Cumberland Rock. The first image was taken on Sol 275 (May 15, 2013) before any preparations took place; the second image is from Sol 279 (May 19, 2013), shortly after drilling. When selecting drill targets, researchers aim the rover’s drill away from any nasty pebbles. First the rover sets down its two stabilizing prongs, then the researchers check and confirm that it’s set up in the right place. In a quickly-established pattern, the ChemCam zapped its laser into the grey tailings to check the rock’s composition. The Cumberland rock samples contained a higher proportion of chlorobenzene than John Klein or Confidence Hills (or the Rocknest soil target). This might be because organic chemicals reacted with perchlorates during heating of the sample for analysis, leaving the starting chemicals undetermined. 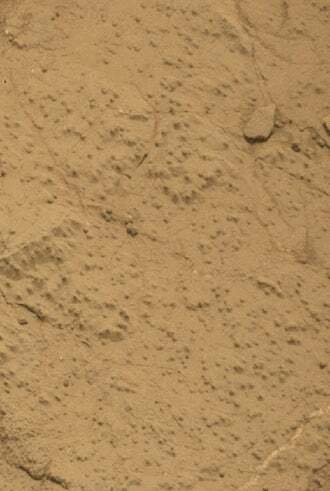 The Curiosity rover made a mini drill hole on Sol 615 (April 29, 2014) to evaluate a chunk of sandstone named Windjana. The shallow hole gave the team a peek into the interior of the target rock and the potential tailings to determine if they’re suitable for a full-depth drillhole. Curiosity drilled a hole into the Windjana sandstone on Sol 621 (May 5, 2014). The Windjana sandstone is within The Kimberley, a set of sandstone layers with variable resistance to weathering. It’s the intermediate unite between areas more sharply eroded by the wind into either buttes on one side or lower-laying rocks scored with striations on the other. The hole was also photographed at night, lit up by light-emitting diodes on the rover. This controlled lighting reduces the shadows of sunlight, allowing for a more controlled look into the hole. The rock is named for the Windjana Gorge in Western Australia. Bonanza King is a rock along the boundary of Mount Sharp. The Curiosity rover tested out if Bonanza King would make a good place to drill on Sol 724 (August 19, 2014), trying to get a first taste of the Murray formation. Under a surface coating of rusty red dust, the rock is actually a greenish-grey. The light-coloured veins crossing the rock are likely infilled with sulfate salts or other precipitate minerals. These features are similar to the veins observed in mudstones in Yellowknife Bay. The rock budged while getting tapped by the hammer to create a starter-hole during the mini drill test. This instability triggered a software protective routine, halting the procedure. The humans checking the results afterwards agreed, marking the rock as too unstable for a full-depth sample-collection drill. The Curiosity rover made its second attempt at getting a first taste of the Mount Sharp rocks by slipping up to a nice set of flat rocks named Confidence Hills. The initial sample drill was delightfully stable, producing a tidy pile of tailings that weren’t oxidized red for once. The rover drilled into Confidence Hills on September 24, 2014, its 759th Martian workday. Confidence Hills is the the first target within the Pahrump Hills outcrop, the target of the rover’s extended mission. The Pahrump Hills are the bottom (or basal) layer of Mount Sharp, so by the Principle of Superposition (aka, “Old things are on the bottom and young ones are on the top.”), it’s also the oldest layer. The research team picked this formation as a drilling target to test the hypothesis that the enormous mountain started as sediments deposited in lakes that infilled and dried out over geologic timescales. The Chemistry and Mineralogy (CheMin) instrument collects the rock tailings to create an X-ray diffraction pattern that allows researchers to determine the chemical composition of the sample. The ratio between the iron oxide minerals magnetite and hematite provides insight into the ancient formation environment of the rock. The higher proportion of hematite at Confidence Hills compared to Cumberland indicates that the Confidence Hills rock formed under more oxidizing conditions. The discovery of hematite in Confidence Hills also marked the first time that the Curiosity rover ground-truthed a mineral previously only identified by remote sensing from orbit. The Mojave rocks are within the Pink Cliffs portion of the Pahrump Hills at the base of Mount Sharp. This particular location was picked for drilling due to an abundance of tiny, slender features that resemble grains of rice. The research team wanted to know if these were evaporate crystals like salt, forming as a briny lake evaporated. The team made a shallow hole by performing a mini drill test at the Mojave rock to decide if it was worth drilling a full hole. 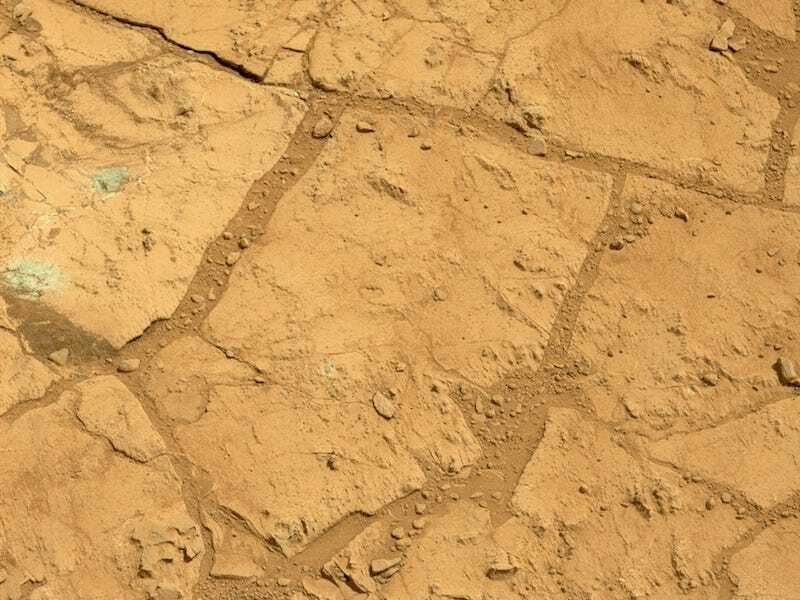 Drilled on Sol 867 (January 13, 2015), even this shallow hole cracked the rock and dislodged pieces. While not particularly good for drilling, the fresh exposures are a rare opportunity to look at intact, unoxidized surfaces. After the initial drilling location broke during a mini drill test, the research team picked a nearby location with the same oddly-shaped crystals: Mojave 2. The rover drilled the full-depth hole on Sol 884 (January 31, 2015). It was the first hole drilled with a new lower-percussion technique, reducing how much energy is pounded into the rock. It was developed specifically to deal with the fragile, finely-layered rocks along the base of Mount Sharp. The new algorithm pounded the drill hole to full depth in just ten minutes while sticking to the lowest two levels of intensity. The second drillhole from Mount Sharp turned up rock that was more acidic than the first taste of the mountain, revealing layered rocks altered by long-gone water. The powdered rock contains jarosite, an oxidized mineral with iron and sulfur; it forms in acidic environments but it isn’t immediately obvious if that reflects a watery formation environment, or an influx of water soaking the rocks sometime later. The rover drilled into the basal layer of Mount Sharp at Telegraph Peak on February 24, 2015, its 908th Martian workday. Telegraph Peak is the the third target within the Pahrump Hills outcrop, and the first full-depth drillhole created without a preliminary shallow mini drill test. While just about everywhere in Pahrump Hills have relatively high levels of silicon compared to aluminum and magnesium, the Telegraph Peak rock has an even more disproportionate bias to silicon. This could be indicative of some amount of acidic leaching of the rocks. The Buckskin rock in the Lion outcrop is an oddly high-silica location, so of course Curiosity had to give it a gentle poke to see if it’d be a good drilling location. The mini drill test on Sol 1059 was lovely, so the rover was good to go for a full-depth deep hole the following day. When the Curiosity rover detected unusually high levels of silica and hydrogen, the rover drilled a hole into Buckskin on Sol 1060 (July 30, 2015). The rock is in the Lion outcrop near Marias Pass, on the lower slopes of Mount Sharp. The two patches of drill tailings are from the drillhole (farther from the rover), and where the rover dumped coarser sample fragments that did not fit through the sieve during analysis (closer to the rover). The tailings spilled downhill during drilling, creating a triangular pile. The rover drilled the hole and took the sample shortly before its landing anniversary; it did not have any short-circuited faults like it had intermittently earlier in 2015. Curiosity most recently lined up in front of a big, flat rocked called Blue Sky. The science team is hoping that this will be a nice, normal rock, a point of comparison for all the interesting and odd alterations they’ve been finding nearby. After setting up in front of a big, flat rock and brushing it clean, Curiosity smashed the most recent hole into planet on September 30, 2015. What will we learn from Big Sky? I have no idea, but it’s bound to be at least a little bit different than everywhere else we’ve looked.